Subway’s November line of sandwiches claims to be “the hottest they’ve ever offered,” and they’re doing it with the help of everyone’s favorite trendy condiment, Sriracha. For the uninitiated, Sriracha is a Vietnamese hot sauce, made primarily from chili peppers, vinegar, sugar and salt. It’s used both as a general term for the style of sauce, as well as the product name for the brand sold by Huy Fong Foods in the United States (this will be important later). Sriracha’s appeal is split; detractors characterize it as little more than a fancy ketchup or hot sauce, but the faithful apply it to everything from burgers to eggs to macaroni and cheese. I’ve had the sauce once or twice, but I was interested to see how the Subway sandwich handled it. And to be honest, my opinion is less important than the answer to this question: How much, dear reader, do YOU like Sriracha? I have to give it to them, though, it IS a clever use of a buzzword. Reminds me of the glory days of “chipotle” stuff. Hopefully, the answer was “a lot,” because this sandwich is all about it. Remember how I said that Sriracha is both the general type of sauce and the brand that everyone buys? I’m not positive, but it seems like the sauce on the sandwich is the former, rather than the latter. For one thing, it’s a “creamy Sriracha,” with a lighter color and thicker consistency than the usual Huy Fong version. This alone leads me to believe Subway developed it in-house, as well as the fact that it’s really spicy. I had mine with pepper jack cheese, green and banana peppers, tomatoes, and onions, which didn’t help the spice any. I’ve always preferred spicy foods with a primary flavor to those that are just hot for hot’s sake. It’s a reason I’ve never really gotten on board with Buffalo Chicken. While the Huy Fong Sriracha we know and love works well for me, this just doesn’t. It’s too hot, without a clear peppery taste to make the burning worthwhile. If I were to do it again, I’d definitely cut it with ranch or mayonnaise to cool it down a little bit. 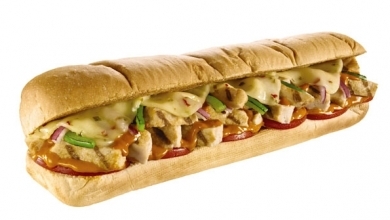 The Sriracha Chicken Melt is around $6 for a six inch sub, which is all I could take of it, honestly. I’ve never been a fan of vinegar-based heat, and that’s really the main thing this has going for it. I’d be really interested in a Subway take on a Bahn Mi, or some other Vietnamese-influenced sandwich idea, but this just feels like they’re trading in on a popular name. But hey, if you like hot stuff, or you looooove Sriracha, maybe you should check it out. Just make sure to grab a drink or something too, you’re gonna need it.